We left Toronto on Thursday evening and after an overnight flight we arrived in Paris at around 7 a.m. The weather was cool at about 20 degrees Celsius. We found a taxi with style a Mercedes sedan and plunged into the morning traffic that was not unlike travel in any number of large urban centres throughout the world. What was different was the motorcycles and scooters that whooshed by between lines of traffic while we were stationary or moving. Daredevils all with inches to spar between them and a spectacular exit from their mortal coil. The journey took one hour and a cost of $100. It was about the same time but pricier then from our home to the airport. Elizabeth was excited wanting to find the first landmark she would recognize. The cab driver joined in the search and shouted out there on the left. Cresting a hill was this wedding cake church Montmarte glistening in white. Next the driver warned us the Eiffel Tower would be seen in one more block and with moving forward we saw it looming dominating the landscape. By now my arm had pins and needles since Elizabeth in her excitement had grabbed my arm and squeezed it senseless. Finally we arrived at Hotel Muguet and three star hotel within four blocks of the Eiffel Tower, two from Napoleon’s tomb in the Hospital des Invalids. Even so it is a quite neighbourhood. We drop off our bags and were told to return at lunchtime to be allowed into our room. We wandered over to the Eiffel Tower and I was delighted to have one of the iconic landmarks to photograph. Elizabeth was excited and delighted at finally being in Paris. The Eiffel Tour looks the same but with a photographer's eye I now notice detail and saw names around the first level. The names are of 72 prominent French scientists and famous personalities 18 names per side on all four side. On the Champ de Mars we came across a sculptural landmark made of a stylo and bronze statues. There was no signage telling you of what it was but I admired it. 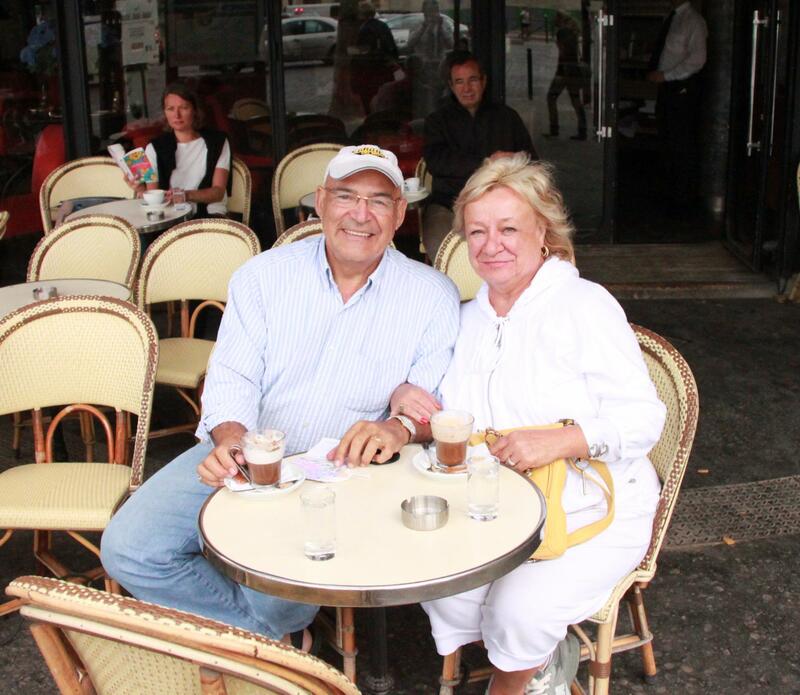 After we walked over to a side street and sought a Parisian lunch. It was then amidst this classic, romantic, culinary, haute fashion, haute cuisine, haute everything that the cultural Jackal and Hyde character of the French showed up. We found a Bistro and wanted to sit inside and since we had back packs and bags wanted a large table. The place was empty save for us. No Monsieur that table with two chairs and the small table is yours but not the large table with four seats. I am the Manager and my word is the law. So we left. Down the street we found another Bistro and wanted to sit outside side by side and view the world and enjoy life. No Monsieur one of you must look into the restaurant with your back to the street and not enjoy yourself. Apparently they don’t know the Italian thought of you go to a restaurant to see and be seen. We left. Two stores down another attempt. We questioned the waiter again can we sit side by side outside and enjoy our lunch. Of course Mousier and so we had our lunch. As we were finishing lunch a group of 10 people came along. They were in their 60’s and as I listened it was apparent they were Italian since that was what they were speaking. I of course chimed in and within minutes the banter was that of finding relatives in another part of the world. Of course the topic of the insanity and dictatorial decorum of seating according to the dictum of the Bistro Code of Seating came up and I was found not guilty by a group of my peers. It was now 3 a.m. in the morning and our circadian rhythm told us we must sleep. We returned to the Hotel Muguet and slept for a few hours. That evening we had little enthusiasm for traveling any distance for supper and ate around the corner at the Bistro Central. We had Onion Soup, Snails, Cobb Salad and Chicken Pillard washed down the French wine. Standard fare for Paris. Yes we sat in the manner we wanted right on the corner outside to see and be seen.